Mar 25 06:55: Magnitude recalculated from 5.6 to 4.8. Kasarani / MMI II (Very weak shaking): I was drunk and felt a slight tremor as I was belching. Thought it was from my belch. Nairobi, Kawangware / MMI V (Moderate shaking): Had to leave the building in fear. voi / MMI VI (Strong shaking): The experiences was horrible, it took me by surprise and I was wondering what was not happening, it was worse at first I though its a bulldozer pulling down my house. Kirinyaga / MMI III (Weak shaking): Felt light shaking like vibration from moving heavy truck at around 7.25pm Sunday, 24/3/2019though no truck was passing. Kiambu (265.1 km NW from epicenter) [Map] / MMI II (Very weak shaking): The house shaked until chairs were drilling. Nairobi / MMI II (Very weak shaking): Light weak tremor. felt as if sofa was slightly moving. Nairobi parklands / MMI IV (Light shaking): It was shocking when i realized the sofa that i was sitting on was shaking. N now all of a sudden, i felt as if the ceiling was going to fall above my head. Arusha, TZ / MMI II (Very weak shaking): Just a bit of shaking, I was the only one to notice in a small restaurant, since i was on a high chair. The liquor in the bottles was also moving:). wundayi / MMI VII (Very strong shaking): things happen quickly, cooking stop and did not know how i got out. everyone was out and could hear the neighbors little daughter blaming the dog for pushing the house to ground. voi / MMI V (Moderate shaking): I felt the ground litteraly shaking and iron sheets buckling. Everyone ran out of the house, it felt like it would collapse. Taita Taveta ,Voi / MMI VI (Strong shaking): This didn't happen only yesterday,but about a week and half ago the same surrounding experienced faint earthquake. You could see a phone on a table vibrating in a couple of minutes. St. Louis Missouri / not felt: Not felt. Embakasi,within east african school of aviation / MMI V (Moderate shaking): I thought its as a result of too much eye strain or somerhing was wrong with me,because i was using my laptop.But i felt it,heard my bed shake and saw my cloth railing shake.It somehow happened twice,Consecutively. Nairobi, Kenya. 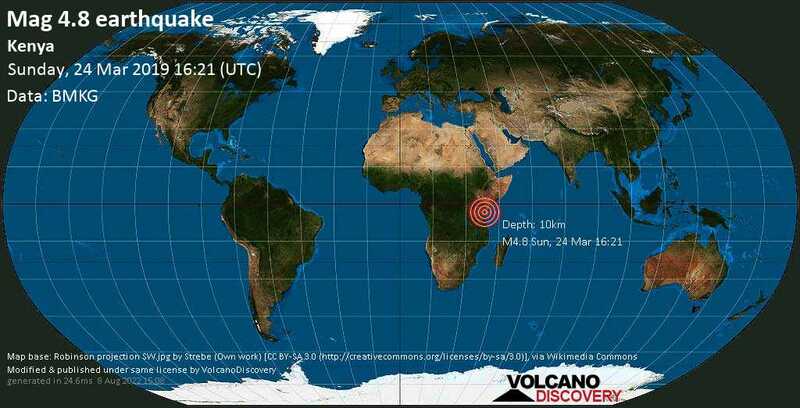 (233.9 km NW from epicenter) [Map] / MMI V (Moderate shaking): Shocking. Nairobi, Spring Valley / not felt: Did it feel anything but our neighbors did! I felt it. / MMI IV (Light shaking): I thought I was the one shaking. Naivasha / MMI V (Moderate shaking): Was lying on my coach, I felt like the seat was shaking. It was a weird very weird experience. Hardy, Nairobi / MMI II (Very weak shaking): Felt like a door slamming that reverberated around the house. Very mild but unsettling. Parklands / MMI II (Very weak shaking): On the 12th floor of a building and felt the tremors for a few seconds. General mathenge road, westlands, nairobi / MMI IV (Light shaking): I was sitting on my bed.. it began shaking for about 10-15 secs then even the doors rattled..
Machakos / MMI IV (Light shaking): I felt a shaking while sitting on a bed. My apartment block actually shook. Malindi, Kenya / MMI IV (Light shaking): The only shaking here was Aisha Juma's waist. But it didn't last for long. RONGAI / MMI III (Weak shaking): The feeling was hardly noticeable but phone at the edge of the table fell down. Sagalla, Voi / MMI VI (Strong shaking): I was in bed and it shook vigorously, cabinet doors opened, 1½ year old child scared and ran for safety, cracks on walls enlarged. Embu / MMI III (Weak shaking): Felt weak shaking.Was my bed. Quarry Lane, Karen / MMI II (Very weak shaking): Slight tremor. Plate fell off the table. meru / MMI III (Weak shaking): was lying on the bed.. Was quite rattled and had to go out just to be sure that the building was not going down! Embu / MMI V (Moderate shaking): Muthatari, Embu rapid shaking for seconds felt. Kiambu,tigoni (267.5 km NW from epicenter) [Map] / MMI II (Very weak shaking): I was in the topfloor bedroom and Felt 2 vibrations approximately 10 seconds apart.each lasted for about 5 seconds. Joyland, Ruaka / MMI IV (Light shaking): Lasted about 20 seconds.All my doors and windows shook and I could see the curtains move. My sofa also shook. NAIROBI WEST, while i was studying in my room with / MMI II (Very weak shaking): I was studying in my study room with complete silence and I live on the second floor. I felt a very mild tremor in earth for at least 4 to 5 seconds. This is very true information because i felt it by myself. Runda, Nairobi (6.2 km SW from epicenter) [Map] / MMI V (Moderate shaking): Squeaking from furniture and doors made me realize something was up. Runda, Nairobi (267.3 km NW from epicenter) [Map] / MMI II (Very weak shaking): Windows were shaking but not very strong. Mirema Springs Estate / MMI V (Moderate shaking): My dustbin fell. I felt like someone was forcing me to move. Kahawa (256.6 km NNW from epicenter) [Map] / MMI III (Weak shaking): One loosely placed item fell from the shelf and tried to convince myself it was a gust of wind. Nairobi / MMI II (Very weak shaking): Felt shaking of my flat from first floor. Lasted for about 10 seconds. mombasa migadini / MMI III (Weak shaking): My bed was shaking. Ongata Rongai. I felt it / MMI II (Very weak shaking): I thought my heart was beating hard. Kitusuru Nairobi Kenya / MMI II (Very weak shaking): Not a big change. Kenya NAIROBI Karen / MMI II (Very weak shaking): Felt upstairs, one storey above ground, for 3 secs - caused me to feel off balance/a little disoriented . I’m guessing 0.5-0.8 Richter scale?? Nairobi / MMI IV (Light shaking): I was half asleep, felt my bed slightly shaking. Ngong town,Nairobi / MMI IV (Light shaking): Mounted TV rattling, chair moved..had to go out. I live in a four storey flat..found my flatmates outside too, shaken..
Nairobi / MMI IV (Light shaking): I was seated and my seat rattled for seconds. My dogs and cat were well aware before me... / MMI VI (Strong shaking): Not at all violent.. just a few more walls with cracks. Nairobi Githurai Mwihoko / MMI IV (Light shaking): A glass bottle lying on the floor fell. Nyeri, Central / MMI IV (Light shaking): Light tremors felt. (264.9 km NW from epicenter) [Map] / MMI IV (Light shaking): I was watching TV and thought the dogs were bumping up against my chair. Then I heard a rumbling and the windows hummed a little. Realized it was an earthquake. ndenderu / MMI II (Very weak shaking): shake for 5-10 seconds. thought it was string wind/gale. (261.7 km NW from epicenter) [Map] / MMI III (Weak shaking): Felt two mild waves. Lower Kabete / MMI IV (Light shaking): Felt like someone was shaking my sofa with me on it. (259.1 km NW from epicenter) [Map] / MMI IV (Light shaking): Two successive ones. Karen, Nairobi / MMI IV (Light shaking): My bed started shaking and a few things fell off my desk. Nyari, Nairobi / MMI IV (Light shaking): I was sitting on my couch and suddenly felt it shake. It was vigorous, but I felt it. Rukuma, next to view point on your way to Naivasha (285.7 km NW from epicenter) [Map] / MMI VI (Strong shaking): Scary! Loitokitok / MMI V (Moderate shaking): Bed shaking, floor and roof shaking. Roof and walls rattling. Karen (254.9 km NW from epicenter) [Map] / MMI IV (Light shaking): I was sitting on my bed and it suddenly felt like someone was shaking my bed, a few things fell off my desk. Mogotio Road, Westlands, Nairobi / MMI III (Weak shaking): I was sitting on the floor (4th floor).. felt light shake.. TV shakes.. can see water shaked in my fish tank.. my son & wife as well felt, they were sitting on the bed..
Spire Plaza, Kabarsiran Avenue, Nairobi / MMI V (Moderate shaking): My couch vibrated for about 40 seconds. My sister's bed shook in her room. Ruiru central kenya (246.9 km NNW from epicenter) [Map] / MMI IV (Light shaking): Shaking of the house and rattling of doors and windows. Valley view park estate mlolongo / MMI IV (Light shaking): After a visit from my brother as he closed the gate behind him 3 minutes later I felt my chair shake my feet wobbled..the gate shook and I thought it was the evening winds and I sent a WhatsApp msg to my sister and she confirmed she felt it too..this was about 1921hrs local In mlolongo. VOI TOWN / MMI IV (Light shaking): haven't felt this strong earthquake in my life...me friend who is 57 said.